FINALLY I have found a salsa that is HOT ENOUGH. I can take the heat, and it seems most salsas, though they claim to be hot, are simply whimpy. The bhut jolokia (Assamese: ভূত-জলকীয়া, Bengali: নাগা মরিচ or বিষ ঝাল), also known as bih jolokia, u-morok, ghost pepper, ghost chili pepper, red naga chili, Naga Jolokia, and ghost chili, is an interspecific hybrid chili pepper cultivated in Bangladesh and Indian states of Assam, Nagaland and Manipur. It is an interspecies hybrid of C. chinense and C. frutescens genes. In 2007, Guinness World Records certified that the ghost pepper was the world’s hottest chili pepper, 900.5 times hotter than Tabasco sauce; the ghost chili is rated at more than 1 million Scoville heat units (SHUs). Classic Tabasco sauce ranges from 2,500 to 5,000 SHUs. However, the bhut jolokia was superseded by the Trinidad moruga scorpion in 2012, which was in turn replaced by the “Carolina Reaper” on December 26, 2013. No wonder this is hot enough! The main chile ingredient was ranked the hottest chile in the WORLD! Heat is important, but I need some flavor too. Perhaps this salsa could use just a tad more of another ingredient to give it a bit more flavor. Salt, garlic, spices. 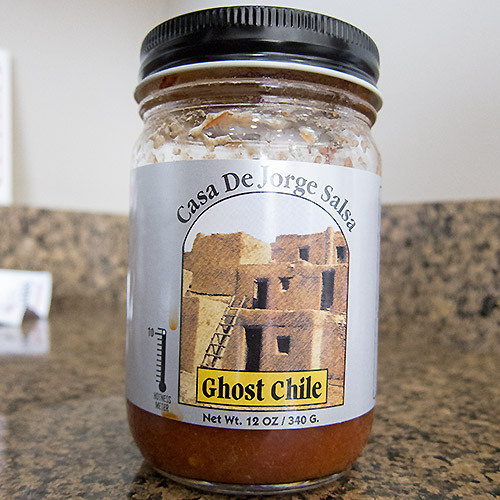 Not sure what, but a little tweak would make this one of the best salsas on the planet. I’m glad you like it! I did bump up the cumin and garlic to give it a nice start before the burn kicks in. Thanks for the comments George. Good stuff.